Love ’em or hate ’em, you can’t accuse China’s architects of playing it safe or being boring. Last month, the world watched (with some skepticism) as China broke ground on the world’s tallest building — the construction team behind the projected 838-meter Sky City plans to whip it up in an unbelievable 10 months. This month, U.S.-based hotel brand Sheraton is opening what might be the oddest-looking piece of hotel architecture you’ll see this year. 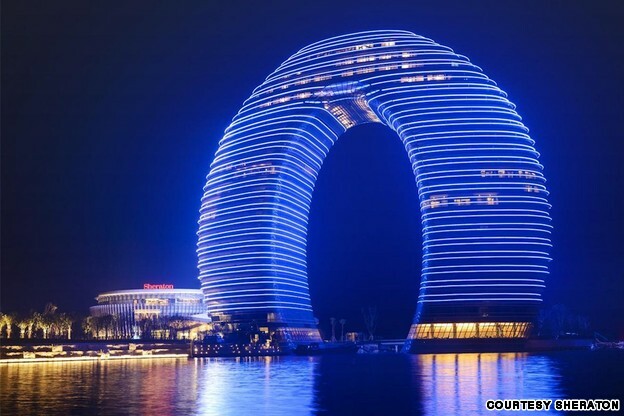 Designed by much-hyped Beijing-based architect Ma Yansong of MAD architects, the Sheraton Huzhou Hot Springs Resort is made up of “layers” of floors to create a ring that rises from the south bank of Huzhou’s Taihu Lake. Called the Sheraton Huzhou Hot Springs Resort, the property is just more than 100 meters high and 116 meters wide, covering an area of 75 acres with a total floor area of 95,000 square meters. Interior spaces aren’t too shabby, either. The floor is paved with Afghan white jade and Brazilian tiger’s eye stone. Just because. 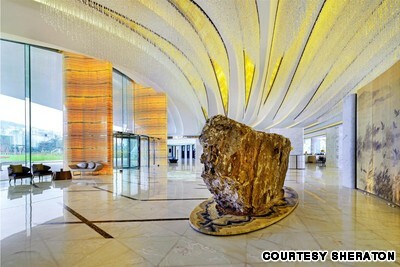 The hotel’s 27 floors have 321 rooms, including 40 suites, 37 villas and presidential suites. Such a property doesn’t come cheap. The property really stands out at night, thanks to an LED light system on the exterior skin that displays animated textures and patterns, all of it reflected on the water’s surface. Huzhou isn’t on the global travel map yet, but it’s a popular destination for Shanghai residents looking for a weekend escape in natural surroundings — it’s just 160 kilometers west of the city. Famous for its hot springs and bamboo forests — scenes from Oscar-winning “Crouching Tiger, Hidden Dragon” were filmed here — Huzhou is particularly busy in spring and autumn. That decision to open a Sheraton here reflects the larger Starwood brand’s heavy focus on China. As for the Sheraton Huzhou, the hotel is now open for guests, though not all facilities will be available until September 31.